As soon as males arrive they begin vocalizing and pursuing mates. Males often stand alert patrolling their territory and keep an eye on their female. They also prospect for potential nest cups and show them to the female. 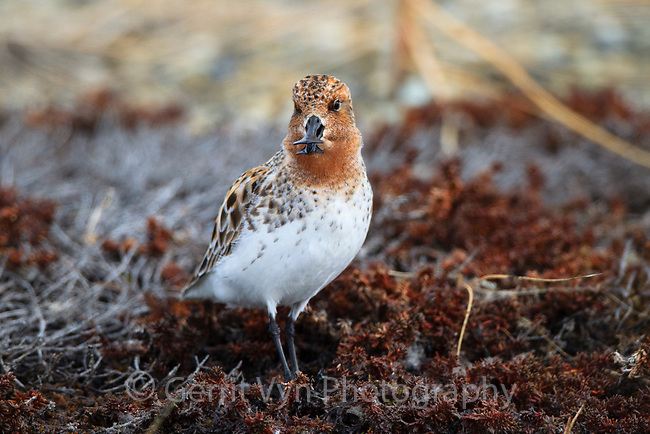 The russet tones on the head and back are part of their breeding plumage and aid in camouflage on the tundra. The crowberry vegetation it is standing on is very typical of this species coastal habitat and nest site locations.Chukotka, Russia. June.